Woods, vineyards and olive groves. The dark foliage of trees alternates with fields in shades of ochre and saffron, dotted with cypresses and cut through by paths older than time. The Montalcino area is a great hill covered with holm oaks and rows of vines, interspersed with noble stone buildings and farms that have witnessed centuries of cultivation of this land; a unique, wonderful landscape, whose charm inspired painters of the Sienese School, and which, together with the Val d’Orcia, is recognized as a UNESCO World Heritage site. ART AND VINEYARDS THRIVE ON SOMETIMES MINIMAL, ALMOST IMPERCEPTIBLE VARIATIONS. ENHANCING THESE DETAILS AND MAKING THEM ABSOLUTE: THIS IS OUR JOB. 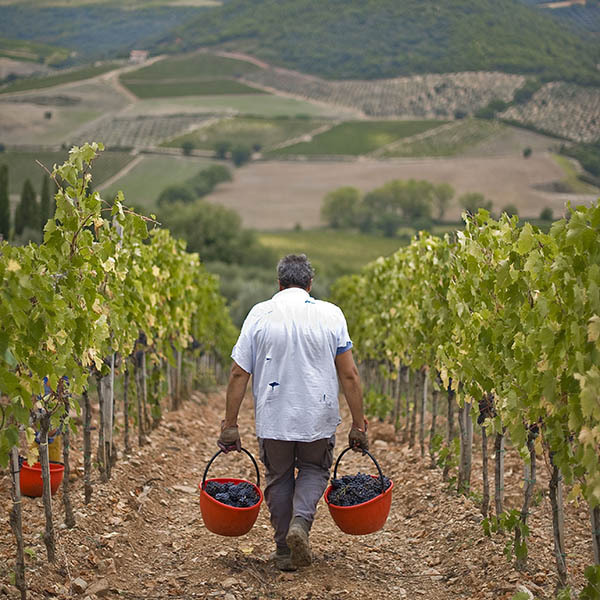 Castello Romitorio cultivates its vineyards in the Montalcino area, the highest expression of the Sangiovese variety. Meticulous care and attention are given to the vineyards and the work between the rows. Our commitment is to highlight and promote the Brunello di Montalcino zones as the expression of a diversified landscape. The character of the wines is inherent in the details, in the micro-variations that distinguish one vineyard from another, expressing a wine’s identity and developing its natural personality. 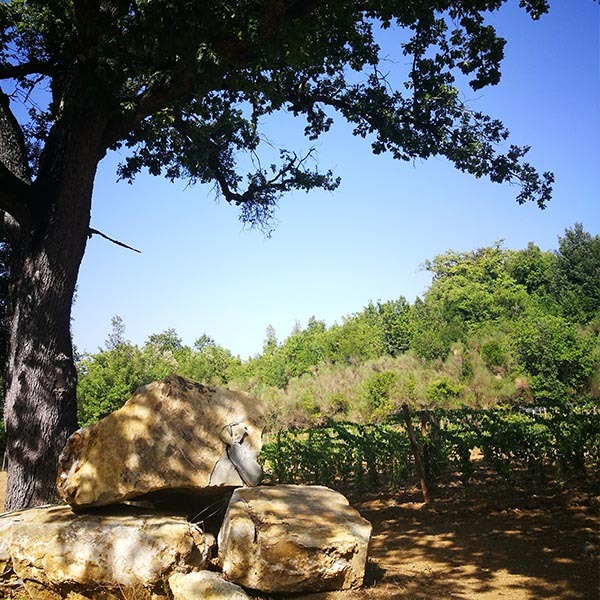 Integrity and selection guide the work in the Castello Romitorio vineyards. Integrity with regard to sustainable choices that respect the biodiversity of this unique landscape and ensure on-going productivity for future generations. Selection because quality in the vineyard comes from careful thinning, sorting the best clusters and intervening promptly. Only by choosing times and methods can we obtain perfect fruit that will continue its journey towards becoming the finest wines. WORKING THE VINEYARD IS LIKE WORKING ON YOURSELF: YOU ALWAYS START FROM WHAT THERE IS, WHAT EXISTS, NOT TO CHANGE IT BUT TO ENHANCE ITS UNIQUENESS, ITS PLACE IN THE WORLD. The distinctive feature of the vineyards around Castello Romitorio is the surrounding environment. Untouched land, carved out of centuries-old holm oak groves, abandoned and lying fallow for decades. In this wild, isolated area, reclaimed with enormous patience and dedication, grapes coexist with the woods that are replete with wolves, deer, magpies, foxes and wild boar. A fascinating, extreme environment that contributes a wholesome character to our wines, a balance between elegance and power, strength and freshness.